Below you'll find some cool Star Wars Party games ideas for your kids birthday party. "Cool Star Wars Party Games!" Planning is the key to every successful birthday party, therefore have a look at our party games and pick the coolest games for your kids party. If you have not looked at our Star Wars Birthday Party Ideas have a look at those ideas too! There you will find lots of Star Wars party ideas for decorations, invitations, food ideas and much more. But now scroll down and check out our cool Star Wars Party Games. Princess Leia Says: Star Wars Party Game similar to Simon says. One player is chosen to be princess Leia, her role is to call out "Princess Leia says" and describe an action, while demonstrating the action, the group must mimic the action. Every one has to do what princess Leia says only if she begins her sentence with "Princess Leia says". If princess Leia says or demonstrates an action without saying "Princess Leia says" the group has to ignore the action. The kids who don't ignore the action are out of the game. The faster Princess Leia commands the more difficult the game gets. Who is the Enemy: Let all kids stand in a circle, with one kid in the middle, who is blindfolded, spin him around 3 times. He or she has to touch the face of one of the kids in the circle and in 20 seconds try to guess who it is. If the blindfolded kid doesn't guess right, the game starts again until he guesses who is who. If he guesses right then he gives the blindfold to the person who he just guessed who it was. Play until every one has guessed at least one time each. Where is Princess Leia: Beforehand blow up lots off balloons and put a small picture of Princess Leia in 1 balloon. The day of the party release the balloons and tell the kids they have to find Princess Leia inside the balloons, so they have to start popping the balloons. The kid who finds the picture of Princess Leia wins. Water Guns Battle: It goes with the theme and its lots of fun. Star Wars Treasure Hunt: Let kids look for Star Wars toys or small treats wrap in aluminium foil. Before the guests arrive hide the treats and toys all around the party room. Before starting to play give each kid their small mini bags to hold the treasure. Give the kids 5-10 min to find the goodies, give them more time if they are younger. 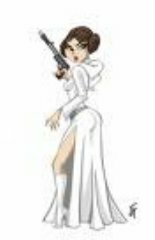 Play Pin The Light Saber Of Princess Leia: Similar to pin the tail on the donkey, before the game draw a large Princess Leia poster to the wall of the party room. Draw and cut a light saber to each guest, write their name on the light saber they will use. When playing the game the kids have to be blindfolded and spin them around three times until they are facing Princess Leia and let one by one try to pin the light saber on Princess Leias hand. The player who places the light saber closes to the correct spot on the poster is the winner. Droids & Clones Wars: Before the game starts divide the children into two teams - the droids against the clones. The two teams will compete against each other using relay games, give a point for every game they win. The team who has most points at the end of the party wins. Example of relay games are: sack races, ball & bucket toss etc. Who said What? : Before the party write some lines from the Star Wars Movies. Divide the kids into two groups. Read the lines and let the kids guess from which Star Wars Movie that quote comes from. The team who has most correct answers, wins. I hope you enjoyed reading our Star Wars party games and I hope our ideas will help you plan a successful Star Wars party for your kid. © Copyright 2007-2012 Girls-Birthday-Party-Ideas.com NOTE: I claim no copyright to any character images used on this site. All character images are © To their original owners.